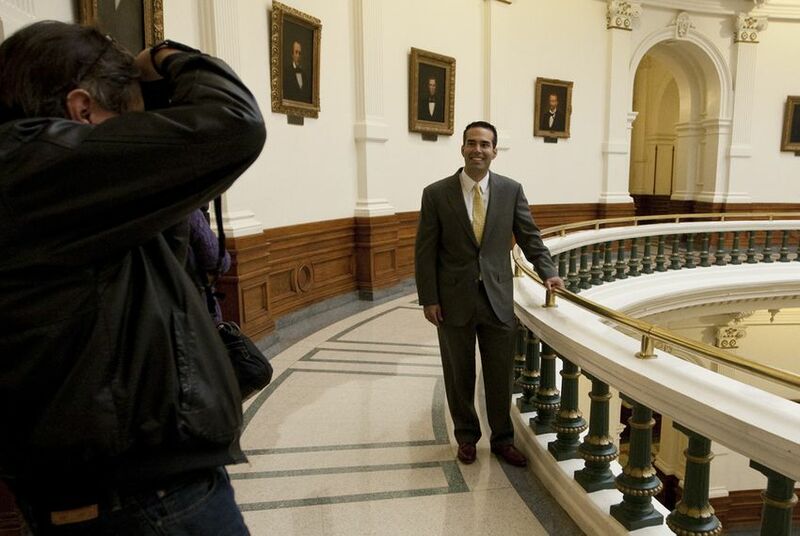 At the Texas Legislative Conference in New Braunfels on Friday, newbie political candidate George P. Bush was smooth, cautious and unremarkable. His aim was to get used to the spotlight without making a bad impression, and he got the job done. There are no sure things in politics. If there were, George P. Bush would be the presumptive successor to Texas Land Commissioner Jerry Patterson. His name — laden with political history — gives him a little bit of pressure and a huge advantage over the competition. It’s some list. Great grandfather was a U.S. senator. Grandfather was a congressman, CIA director, ambassador, vice president and president. Uncle was a governor and a president. Father was a governor. The advantage is that his announcement alone might be the end of his first quest for office, and not in a bad way. He filed for what is expected to be an open seat, since Patterson has said he’ll run for lieutenant governor in 2014. He can raise money during the legislative session — something no state officeholder is allowed to do under conflict-of-interest laws. It’s hard (don’t forget that opening caveat) to imagine a serious Republican choosing to run against him or a serious Republican donor contributing to such an opponent. If Democrats don’t turn their own fortunes around, winning the GOP primary will remain the equivalent of winning the general election. The start of this particular race could be the end of it. He’s in, nothing to see here, move along to the next contest. But the expectations and curiosity about the fresh prince are high, which is why he drew a full room at the Texas Legislative Conference in New Braunfels on Friday, including a bank of reporters and cameras. Many were seeing him for the first time. It might be a while before they see him again. He’s spending most of his time raising money, turning down most appearance and interview requests. He has done a couple of media interviews — including one with the Tribune — and makes an appearance here and there, such as the one Friday. But his is a cautious political operation, starting out in relatively small, controlled situations. It’s reminiscent of the early campaign of George W. Bush, who worked out his speeches and positions outside the spotlight in the early run-up to his 1994 challenge to Gov. Ann Richards. George P. was careful Friday and kept his remarks, at about 15 minutes, about as short as a conference keynoter politely can keep them. He noted an earlier visit with his uncle, then the governor. He mentioned his wife, pregnant with their first child. He wove his resume into his remarks, mentioning a couple of business startups, work in a law firm, a high school teaching stint, a tour in Iraq with Navy intelligence, and now this run for statewide office in his adopted state. He said admiring things about education reforms working in the Legislature, nodded to the Republican tenets of limited regulations and low taxes, and made a pitch for education and help for veterans. That’s a natural spot for him to talk about his own service and about the land office’s involvement in the Veterans’ Land Board and other issues. He was smooth and unremarkable. The aim at this stage is to get used to the spotlight without making a bad impression, and he got the job done. He could fizzle, or he could be the next star of the Texas GOP — a secret weapon for a party threatened nationally by demographic change, generational and economic and social tensions. He’s like Ted Cruz in that way, but with stronger ties to the establishment side of the party. Cruz exceeded expectations, overcoming a sure thing in his bout with Lt. Gov. David Dewhurst in last year’s Republican primary for Senate. Bush begins with expectations on the other end of the scale but seeks the same result: a place in the next generation of the state Republican party. Cruz had the advantage of a low bar to get over. Bush has the advantage of a gold-plated name and a burgeoning political bank account. Cruz was expected to lose, and he played the gambler in his race. Bush is expected to win, and he is playing it safe. At the end of his short talk, Bush thanked the audience, left the podium and walked out the side door — without stopping to meet and greet potential supporters and gawkers or to answer questions from the inquisitive reporters. With the thing in the bag and a year to go before the primaries, why take the risk?